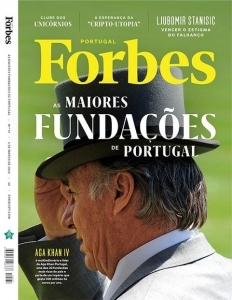 Forbes Portugal - Major Fundacoes de Portugal | Ismaili.NET - Heritage F.I.E.L.D. Aga Khan IV, the spiritual leader of the Nizari Ismailis, brought his millions to Portugal, where he now lives without paying taxes. The Aga Khan Foundation Portugal, the 24th largest nationwide, is just one of the ends of his philanthropic empire that spends more than 500 million Euros per year. Aga Khan IV, 82, is a multimillionaire and a philanthropist. The Aga Khan Foundation Portugal, which he established in 1996, was valued at over 31 million Euros in 2017. It was the most valuable event for the Portuguese economy in 2018. The organisation invested 15 million euros to receive about 55 thousand people. Parque das Nações in Lisbon was flooded: seats at the Altice Arena, the Lisbon International Fair [FIL], the Portugal Pavilion and all the cinemas at the Vasco da Gama Shopping Centre were occupied. The consultancy firm hired by the organisation calculated a direct impact on the Portuguese economy of up to 252 million Euros, even surpassing that of Web Summit, the largest technology conference in the world (which will have had a maximum impact of 212 million Euros, according to Professor Cerejeira, professor at the School of Economics and Management of the University of Minho). What event beat the economic effect of Web Summit? It was the closing festival of the Diamond Jubilee celebration of Aga Khan IV as spiritual leader of the Nizari Ismailis, a branch of the Shia Muslims, held in Lisbon from the 5th to the 11th of July 2018. Although it received fewer visitors than Web Summit, the celebration of the 60 years of activity of the current Imam brought over richer people. "The [Ismaili] community that came to the celebration was mostly the wealthiest, because it has more means to travel," explains Nazim Ahmad, the diplomatic representative of the Ismaili Imamat in Portugal, the supranational entity that represents the Imam. Nazim adds that while they received 35 nationalities at the event, US and Canadian citizens were present in greater numbers and that many visiting families took the opportunity to discover the rest of Portugal. The Ismaili community is "regarded as Westernised, wealthy, consisting of engineers, doctors, economists and managers, businessmen and financiers, actors with success stories," summarise Nicole Khouri and Joana Pereira Leite in a working paper from the Centre for African, Asian and Latin American Studies, of the Lisbon School of Economics and Management. In 1957, Karim Al-Hussaini succeeded his grandfather, Aga Khan III, becoming the 49th Imam of the Nizari Ismaili community, which is estimated to comprise 15 million followers, including some 7,000 that reside in Portugal. The Nizari Ismailis believe that Aga Khan IV is a direct descendant of the Prophet Muhammad. The first Imam, Ali, was Muhammad's cousin and son-in-law when he married his daughter Fatima. Aga Khan IV is a multimillionaire and a philanthropist. His closeness with Portugal Portugal, the third place in Europe with more followers after Great Britain and France, has been progressive. In 1996, Aga Khan established the Aga Khan Foundation in Portugal, after 13 years with a presence through its Swiss foundation. At the end of 2017, the Portuguese foundation had a net worth of 31.1 million Euros, which placed it at 24th in the list of the largest Portuguese foundations. "The Aga Khan Foundation Portugal's capital increases represent the institution's commitment to Portugal and the strengthening and consolidation of investment in development programmes," explains Karim Merali, the Foundation’s Exeutive Officer. Aga Khan IV is the honorary president of the Portuguese foundation. His brother Amyn and Guillaume de Spoelberch, a Belgian viscount, complete the board of directors. Although not a monarch, the Imam has always been close to European royalty. In fact, he is introduced at official ceremonies as "His Highness", a title given to him by Queen Elizabeth II, after becoming leader of the Ismailis at age 20. He is now 82 years old. In Portugal, Aga Khan, who is a British citizen, is received as a Head of State, although he does not represent any state. At the end of the celebrations of the Diamond Jubilee in Lisbon, the President of the Republic of Portugal, Marcelo Rebelo de Sousa, welcomed him with a guard of honour. In the Assembly of the Republic, he delivered a speech in the Senate Chamber. The institutional proximity to Portugal dates back almost six decades. In 1960 Américo Thomaz, then President of the Republic of Portugal, awarded him the Grand Cross of the Order of Prince Henry, one of his first international decorations. He returned to receive other grand crosses of Portuguese orders. The culmination of the closeness to Portugal was the establishment of the global Seat of the Ismaili Imamat in Lisbon. The site, the Mendonça Palace, designed by the architect Miguel Ventura Terra in the early twentieth century, was purchased for 12 million Euros from Nova University of Lisbon, but will require an additional amount between 3 million and 5 million euros in the restoration leading up to the full opening, in the summer of 2020, according to Nazim Ahmad. "The signing of the historic agreement [between the Imamat and the Portuguese Republic] to establish its Seat in Portugal is a historic milestone in our 1400 years of history. We share with Portugal the values of tolerance in the diversity of communities and cultures and we have an immense respect for the country's commitment to share knowledge for the improvement of communities around the world," Aga Khan IV explained to Expresso in 2017. In parallel, Aga Khan himself bought a home in Lisbon. "In Portugal, I always felt at home," he said upon receiving an honorary doctorate from Nova University of Lisbon in 2017. The construction of the first Aga Khan Academy in Europe, a school that aims to host a thousand students from 5 to 18 years old, has also been under development for over two years. The land where it will be established, near Taguspark in Oeiras, represents a 4 million Euro deal with Parvalorem, the entity that succeeded Banco Português de Negócios, according to Jornal de Negócios. However, the total investment in the academy will be close to 100 million Euros over the next three to four years, Nazim Ahmad estimates. All these amounts - 15 million for the Diamond Jubilee celebrations, more than 15 million for the Seat of the Ismaili Imamat and 100 million for the academy do not go through the Portuguese foundation. Those are other millions. In just three years, from 2014 to 2017, the annual budget of the Aga Khan Foundation Portugal increased 77% to around 14 million Euros. It is a drop of water in the ocean that is the philanthropic arm of Aga Khan IV. The Aga Khan Development Network, which includes the Portuguese foundation, has an annual budget of 530 million Euros. This charitable universe employs more than 80,000 people worldwide, provides annual education programmes to more than 2 million children, and provides health care to 5 million people. Although the Aga Khan Portugal Foundation reported profits of 3.6 million Euros in 2017, unlike previous years in which there were losses, it is hoped that the net results are always close to zero. "The goal is that the donations be fully allocated to the various programmes," says Karim Merali. The positive result of 2017 "is due to the investment in the Aga Khan Academy in Maputo", clarifies Karim who, before being the Executive Officer of the Aga Khan Foundation Portugal, held the same position at the Polana Hotel in Maputo, Mozambique. The Aga Khan Academy in Maputo was, in fact, the second largest recipient of donations to the Portuguese foundation in 2017. The Coastal Rural Support Programme, which aims to combat poverty in Mozambique, was the largest recipient of funding. The World Bank, the largest financial institution for global development, was the main funder of the Coastal Rural Support Programme in the African country. However, Aga Khan IV remains the largest donor to the Portuguese foundation and his importance has been growing. In 2017, the Imam donated 5.4 million Euros, more than double what he had donated two years earlier. In 2017, three-eighths of the funding applications of the Aga Khan Foundation Portugal stemmed from its founder. Although the foundation has Portugal’s name, only one-fifth of the money received is directed towards national projects. Most of the funds go to Mozambique. KCidade, an urban community development programme, and the Early Childhood Development Programme, which includes the operation of the Olivais Sul Children's Centre in Lisbon, are the largest projects of the foundation in national territory. They receive, individually, more than 1 million Euros per year. The economic empire of Aga Khan IV is based on a Swiss corporation, the for-profit Aga Khan Fund for Economic Development (AKFED). It is this firm, through a myriad of subsidiaries, that feeds the various foundations and projects that its sole shareholder has created and supports. "I never receive dividends, because the purpose is to serve with the resources and not to personalise them. The notion that an institution with the name Aga Khan is personal is incorrect. Be it a university, a hospital, a school or a micro-credit," he said in 2008 to Público. The eight holdings that AKFED controls in companies listed on the Bangladesh, Ivory Coast, India, Pakistan and Kenya stock exchanges are worth around €1.1 billion alone at market prices. However, the group is also a shareholder of another 70 companies around the world, in cities such as Kabul (Afghanistan), Bishkek (Kyrgyzstan), Kampala (Uganda), Dushanbe (Tajikistan), Geneva (Switzerland), Toronto (Canada) and Ouagadougou (Burkina Faso). The scope of Aga Khan IV's business world encompasses a wide range of sectors, including food, aviation, media, energy, telecommunications and insurance. In 2017, it made 3.6 billion Euros. The official list of AKFED shares does not include Portuguese companies, although the Ismaili Imamat, also under the control of Aga Khan IV, has created national companies, namely for the construction and management of Mendonça Palace and other future projects that will be announced next summer, said Nazim Ahmad, who oversees these companies. Despite a strong devaluation (approximately 50% in two years), the HBL is probably the most valuable asset on the AKFED's balance sheet: it is Pakistan's largest private bank, with more than 11 million customers and 1,750 branches. On the Stock Exchange, the HBL is worth approximately 1.4 billion Euros, 51% of which is owned AKFED. HBL is also the largest Pakistani multinational: it has a presence in the UK, United Arab Emirates, Central and South Asia, Africa and the Middle East. There is a clear desire for expansion of the group that has Aga Khan IV as its sole shareholder. For such purposes, it takes advantage of the possible synergies between the subsidiary companies. "In addition to strong financial support from AKFED, TPSEA leverages the fund's global network to ensure new business opportunities," said Eyal Shevel, an analyst at Global Credit Rating, the largest African credit risk assessment agency, in its latest evaluation of the hotel group. TPSEA, controlled by AKFED, manages the Serena hotel chain, which comprises 35 units in Africa and Asia, including Polana, in the Mozambican capital. Receives the Grand Cross of the Order of the Prince Henry of President Américo Thomaz. The foundation of Swiss law is authorised to operate in Portugal. Aga Khan IV is received by President António Ramalho Eanes and Prime Minister Francisco Pinto Balsemão. Establishes the Aga Khan Foundation in Portugal. The initial allocation was 11.7 million Euros in bank accounts, investments and real estate. Receives the key of the city of Lisbon from the Mayor, João Soares. Receives the Grand Cross of the Order of Merit. Signing of the cooperation protocol between the Portuguese Government and Ismaili Imamat. Receives Grand Cross of the Military Order of Christ attributed by President Jorge Sampaio. Receives an honorary doctorate from the University of Évora. Signing of the cooperation protocol between the Portuguese Ministry of Foreign Affairs and the Ismaili Imamat. Signing of the agreement between the Portuguese Republic and the Ismaili Imamat. Portugal recognises the Imamat as a legal entity. Invested as a Foreign Member at the Lisbon Academy of Sciences in the Class of Humanities. Receives the North-South Prize from the Council of Europe in the Assembly of the Republic. Ismaili Imamat purchases the Mendonça Palace, which will be its glocal Seat, to the Nova University of Lisbon. Receives the Grand Cross of the Order of Liberty from the hands of President Marcelo Rebelo de Sousa. Receives an honorary doctorate from Nova University of Lisbon. Ismaili Imamat purchases land from Parvalorem for the construction of the Aga Khan Academy. Although the foundation has Portugal’s name, only a fifth of the money received is applied in the country. In 2018, for the Diamond Jubilee celebrations of Aga Khan IV, which brought with it more than 50 thousand people, the spiritual leader of the Nizari Ismailis spent about 15 million Euros. The consultancy firm hired by the organisation estimated a direct impact on the Portuguese economy of up to 252 million Euros, more than that of Web Summit. All donations made or received by Aga Khan IV or by the Ismaili Imamat are exempt from taxes in Portugal. This is one of the negotiated rules for the establishment of the global Seat in Lisbon. It is a very important exemption: the Ismailis make the religious donations directly to the Imam or the Imamat. "The payment of 'dasond' [religious fee] [is] an exclusive prerogative of the Imam, the main source of wealth of the Aga Khans," wrote researcher Eva-Maria von Kemnitz, former director of the Institute of Oriental Studies of the Catholic University of Portugal. The tax exemptions of the Imam and the Imamat also extend to taxes on real estate, cars, boats or airplanes and the VAT paid is subject to reimbursement. In addition, the Imamat may receive, hold or transfer "funds, securities, gold and other precious metals or currencies." In the agreement reached with the Portuguese State, it was also defined that Aga Khan IV, his family and the senior officials of the Ismaili Imamat will receive diplomatic treatment and judicial immunity, as well as tax exemption on their salaries. He is internationally known as "His Highness", although he is not a Head of State. In 2018, during the celebrations of the Diamond Jubilee in Lisbon, he was welcomed by the President of the Republic of Portugal, Marcelo Rebelo de Sousa, with a guard of honor, and even delivered a speech the Assembly of the Republic. By accelerating donations to the Portuguese foundation, Aga Khan IV has also increased the weight of his contributions on the organisation's budget. Three-quarters of the Aga Khan Foundation's funds come from his pockets, even though the institution has more than 30 funders. In 2017, the Aga Khan Portugal Foundation reported a profit of 3.6 million Euros, unlike previous years when there were losses. Mozambique receives most of the funds from the Aga Khan Portugal Foundation. In 2017, 79% of the donations were directed to projects in Mozambique. These four programmes absorbed three-quarters of the foundation's resources that year. This project seeks to mitigate the poverty and underdevelopment of the three northernmost provinces of Mozambique. With such disparate programmes as the training of farmers and the organisation of financial savings groups, the Coastal Rural Support Programme reaches the areas of agriculture, civil society, financial inclusion, education and health. In 2017, it benefited 35 thousand people. Approximately 61% of the funding for this project came from the World Bank. After Mombasa, in Kenya, and Hyderabad, India, the Aga Khan Academy opened in Maputo in 2013. This education facility currently covers kindergarten through to eighth grade education, but it has plans for expansion. All of the 2017 funding came from the fortune of Aga Khan IV. K'Cidade is the community development programme of the Aga Khan Portugal Foundation which opened in the Lisbon Metropolitan Area, but has expanded to Porto, Trofa and Maia. This project seeks to mobilise people and organisations for collective action. Aga Khan IV financed 61% of the funds needed in this project. The rest came from public and private entities, such as the Regional Coordination and Development Commission of Lisbon and Vale do Tejo and the Lisbon City Council. At the invitation of the Social Security Institute, the Aga Khan Portugal Foundation has managed the Olivais Sul Children's Centre since 2009. The experience led the organization to expand the programme to other areas. It now includes, among others, nursemaid training courses and parental education programmes for expecting couples. Less than half of the funding for the Early Childhood Development Programme comes from Aga Khan IV. The Social Security Institute and pharmaceutical company Johnson & Johnson were the second and third largest funders, respectively. In addition to the increasing budget of the Aga Khan Foundation Portugal, the investments made have also taken shape. One of the recent projects is the construction of the Aga Khan Academy in Europe, a school that aims to receive 1,000 students from ages 5 to 18 . The first check had a value of 4 million euros and was used in the purchase of the 40 acre land in Oeiras, where the Academy will be built. However, the total investment in the academy will be around 100 million Euros over the next three to four years. Nazim Ahmad (in the photo), who represents the Ismaili Imamat in Portugal, guarantees that the foundation will not stop here. He promises new projects in Portugal. The announcement is reserved for summer. Born in Geneva in 1936, raised in Nairobi and educated at Le Rosey and Harvard, Aga Khan IV travels with a British passport and spends much of his time traveling the four corners of the globe on his private plane, but his current residence is Lisbon.